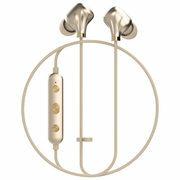 Accessorize your look while listening to your favourite tunes with the Happy Plugs Ear Piece II in-ear headphones. The stylish, jewelry-inspired design wirelessly pairs with your device with Bluetooth connectivity to access your music and more. They deliver consistent, high-quality, well-balanced sound with 8 hours of playtime on a single charge. 400 W. Bluetooth. Why pay $214.99.